This piece has been lightly edited and was originally published here on Medium. A couple of months ago I had another terrible descent into depression. I was doing too much and not letting myself have any time to relax. Now, I seem to be doing just fine other than a few isolated incidents. I saw a therapist. He told me exactly what to do to get better, and I did it. But the one thing he said to me as I was leaving has stuck with me more than anything else. I’ll never forget it. This principle has been critical to my ability to take better mental care of myself. Here are a few ways that this analogy holds true for those of us with depression. 1. You can see the light at the end of the tunnel. Depression is not permanent, and it’s not your fault, either. Sometimes, all you have to do is just keep moving and you will make it through. But whether or not you are moving, the light is always there. 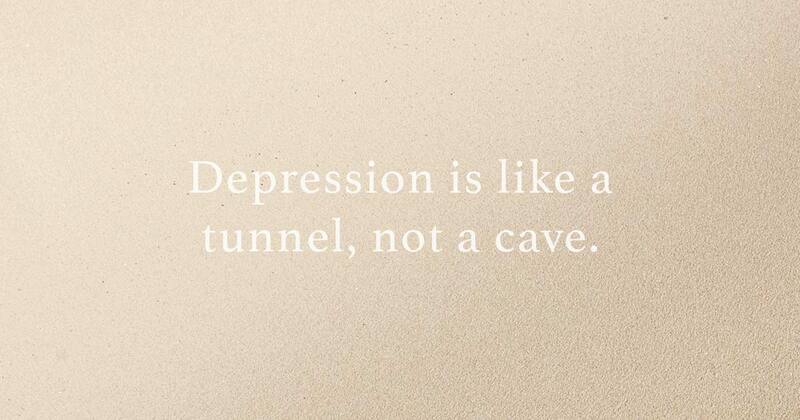 Through therapist visits, self-care, and medication when necessary, you can reach that light at the end of the tunnel. Sometimes the light can be difficult to see, yes. These are the days that we have to admit and even accept where we are to be able to turn our minds towards the light that is coming. This is one of my best techniques for coping with depression on difficult days. I just simply accept it. I treat it for what it is — a sickness. Like the cold. I continue to live the day recognizing that I can only do so much, and at the end of the day what I’m experiencing is a chemical imbalance that I did nothing to cause. And at the end of the day, I know that the light is going to be back again. 2. There are days of light and days of darkness. Think of a train traveling through a mountain range. This train might go through multiple tunnels on its journey. Sometimes the tunnels are close together, and sometimes they are far apart. There are days that we are happy. Days that we are sad. And days that we may experience these feelings and more, back and forth, all day long. But just because you are experiencing happiness or sadness that doesn’t mean that days of happiness aren’t ahead. And days of sadness as well. Remembering this fact has at least two benefits. First, we can recognize when we are down that better days are always coming. We can learn to enjoy the journey. Second, on good days it’s also important to recognize that we may be susceptible to a day of depression at any time. 3. Take in all the light you can when in the darkness. Do you know what your eyes do when you are in a dark area? Your irises enlarge so that they can take in more light. This is what it means to let your eyes adjust to the darkness. This is why you can see better after a little while of being in the dark — because your irises have become larger and are taking in more light. If you were on a train that was in a tunnel, your irises would become larger the longer you were in the tunnel. Your capacity to take in light would increase. Teach your mind and heart learn to grow to take in more light when you are in darkness. Whenever you are depressed, do whatever you can to take in more light. Literally, go outside and soak up the sun to increase your Vitamin D, which has been shown to be a key ingredient in mental health. Exercise, sleep, a healthy diet, and solid boundaries are all at the top of the list for effective ways to treat depression without medication. Start small though. I had to start with sleep because I knew that it was something that I actually felt like doing. We all know how hard it is to get up and get moving when we’re depressed. Take it slow. Go easy on yourself. Thank you, I really needed this today. Especially with all the stress that exams and assignments are bringing, I’ve been feeling really down in the dumps. I needed to hear this, there are a lot of days where I have no idea what’s going on in my life. A few days ago, I had a moment where; first, I was happy, nothing was wrong, then I got agitated for no reason, and then I broke down and cried. There was nothing I could do to stop myself from that train wreck. I was exhausted after that, so I had a nap, and it’s okay to do that sometimes, especially after you’ve had an anxiety attack or another form of overwhelming emotions. It’s okay to rest, it’s okay to shout and scream and stamp your feet, it’s okay to feel regret, and most importantly, it’s okay to feel sad. Just remember there is that light at the end of the tunnel. Always keep fighting, there is an end to this tunnel, and you can make it there. Thank you. Beautiful essay. Thank you. It is important others can see they can get through it. For someone with real clinical depression, this comes off as superficial and vapid. Thank you for this, especially the analogy to the eyes adjusting to the dark. It is so easy to fully close off and cocoon when the darkness closes in, instead of opening wider to take in the small beams of light that remain.